The Rancor Pit :: View topic - Ships, vehicles and whatever else you may use or run into. Ships, vehicles and whatever else you may use or run into. The Rancor Pit Forum Index -> The Clone Wars: A New Threat - Wisconsin Wookie -> Ships, vehicles and whatever else you may use or run into. 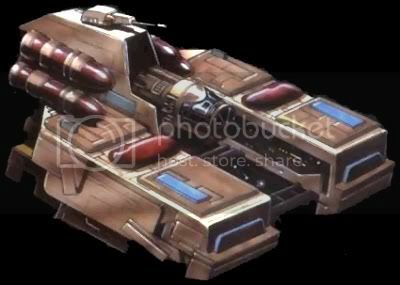 Posted: Wed Sep 14, 2011 9:13 pm Post subject: Ships, vehicles and whatever else you may use or run into. Fully restocked consumables (paid for by funds from previous job). In addition to some new images, I'm including some of the original images that Wisconsin Wookiee posted, but in a higher resolution so you can see more detail. Bear in mind that I've never seen anyone draw/design the HT-2200 the same as anyone else did (even within WEG material); so none of these and all of these are "correct". That means that we can mix and match aspects of design (with Wisconsin Wookiee's approval, of course) to what we feel like our ship should be. Please comment in the OOC thread and let your feelings and thoughts be known on the subject! I am hosting all images on ImageShack for the sole reason that sometimes websites go down or just plain go away forever, and then you're left with dead links to images that you can't get back. Note that in every illustration ever drawn (to my knowledge), the huge upper banks of engines are shown...even though in the fluff text these are stated to be aftermarket additions. 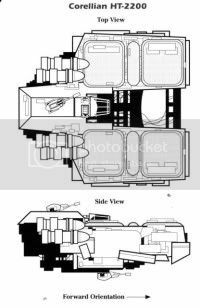 Notice that in the side view, the ventral turret is underneath the cargo holds; this matches no known deckplan, and a gunner would have no way of getting to it with current available deckplans. The area in the cockpit behind the crew positions seems largely wasted, and this deckplan only has one level to it, even though it is clear that the HT-2200 is a very "tall" ship, and should have at least two deck elevations. Additionally, the cargo/entry ramps seem too skinny for loading anything more than small pieces of cargo, awkwardly placed, and make an inefficient use of space. Large fold-down doors or even large sliding doors would make much more sense for the cargo sections, with maybe a central cargo lift section flush to the floor/deckplates for each. A separate entry ramp underneath the cockpit would work best. Here are some more deckplans; honestly, I like some aspects of these better, and I may come up with my own versions of these for my own use. The main problem with these deckplans is the scale...for some reason he made them ~28 meters in length, when they're supposed to be 54.8 meters in length. The other problem with these is the fact that with the artist's "stock" configuration, you can't access the cargo holds from inside the ship. The "militarized" and "medical" modified configurations solve this problem, though not the way I would. Wisconsin Wookiee, let me know if you are open to using these alternate deckplans, and everyone else, speak up if you like these better, and why. The images are rather large, so I'm including large thumbnails that you can click on to view the larger images. All credit for the below images/deckplans goes to Ben Flood-Paddock at Colonial Chrome. Personality - Needles is more quiet and reserved than most of his brothers. General - Needles scored lower than some on basic combat, but clearly demonstrated a concern for his brothers that quickly steered him toward medical training.� Needles feels it is an honor to serve as a medic in the Clone Army. Nihl can dole them out as he desires, though some obviously goes to certain members of the squad. This is all the gear the Clones are bringing along? Bri'tan is going to be very dissapointed.